Built to offer period-correct vintage tone coupled with modern design considerations, Schecter Guitars' Coupe hollowbody guitar will please any player seeking to take a road-trip through yesteryear's sonic landscape. Sporting a full-hollow maple construction, 3-piece maple neck with ebony fingerboard, and two Tesla Filtertron pickups, the Coupe offers a smooth, clear, and balanced tonality with a full-yet-firm low-end and sweet, ringing treble response. 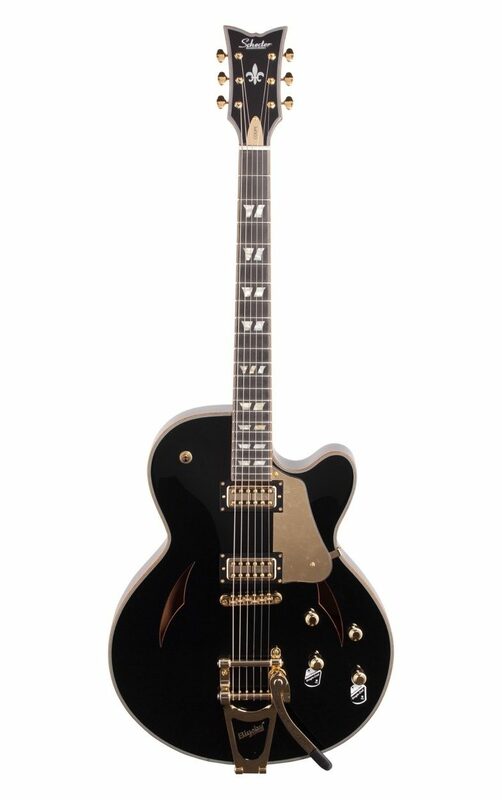 For further versatility, the tone controls each feature a push-pull coil splitting option for their requisite pickups, and the Bigsby B70 tailpiece with TonePros locking roller-saddle bridge combine to offer a rock-solid foundation while allowing for all those old-school vibrato embellishments. To top it off, the open-back Grover Sta-Tite tuners deliver vintage looks with modern tuning stability. Available in Gloss Black and Dark Emerald Green finishes, this is one Coupe made to turn heads and command attention. Optional SGR-13AC case sold separately.